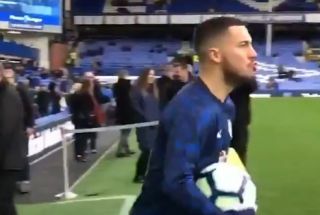 Eden Hazard is a great player, and a bit of a joker too, as this video of the Chelsea star that’s been doing the rounds shows. As the Belgium international enters the pitch at Goodison Park yesterday, he briefly decides to join in with Everton fans booing the returning Ross Barkley. Barkley moved from Everton to Chelsea last season, and it’s perhaps unsurprising to see he wasn’t given the warmest welcome on his first visit back to his old club. Hazard enjoyed the moment, however, as he joined in in jeering the England international in the amusing video clip you can see above.